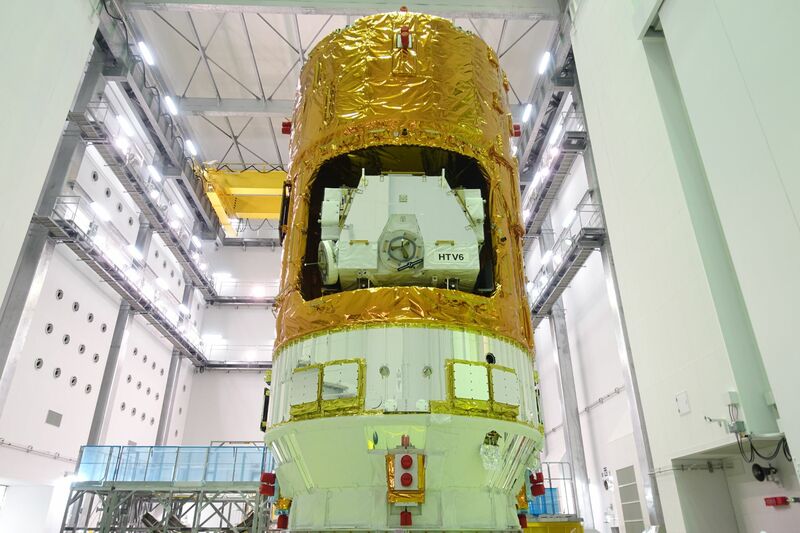 Japan’s HTV-6 spacecraft, launched atop an H-IIB rocket on Friday, is en-route to the International Space Station for a robotic capture on Tuesday to mark the start of a six-week stay for the delivery of important cargo including the first batch of batteries to revamp the ISS power system. 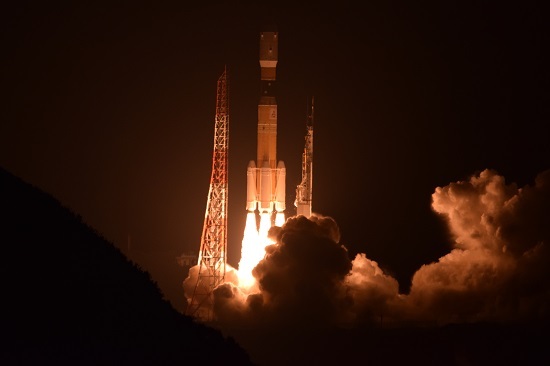 The 57-meter tall H-IIB rocket carrying HTV-6 blasted off from the Tanegashima Space Center at 13:26 UTC on Friday, lighting up the night skies over the picturesque launch base as it swung to the south-east to deliver the cargo vehicle into the orbital plane of ISS. H-IIB was in action for 15 minutes, sending the 16.5-metric ton cargo vessel on its way after a flawless climb into orbit, heading off on a four-day link-up with the Station. 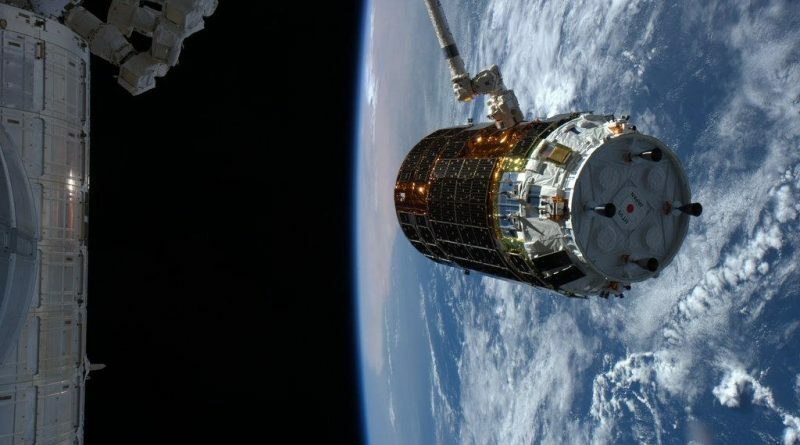 External cameras on the Space Station caught a glimpse of the ascending H-IIB rocket as ISS had just passed over Tanegashima Island and was still within a line of sight when the vehicle took flight. Starting out in an orbit of 189 by 302 Kilometers, HTV-6 overtook the station a short time after launch – set to catch up an entire lap around Earth over the course of its methodical rendezvous. 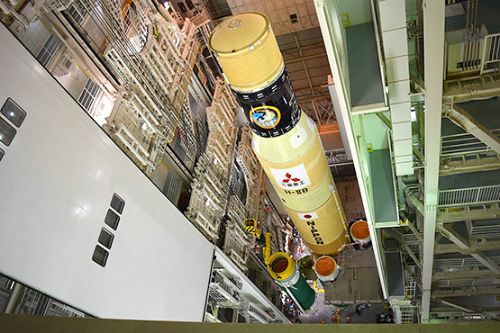 Following separation from the carrier rocket, HTV-6 successfully established communications with the Tracking and Data Relay Satellite System to receive commands from JAXA’s Mission Control Center in Tsukuba. The spacecraft then primed its thruster system comprised of 28 110-Newton engines to dampen residual body rates with three-axis stabilization on the vehicle confirmed 58 minutes after liftoff. At 21:03 UTC on Friday, HTV-6 fired up its quartet of BT-4 engines for the mission’s first orbit-raising maneuver – placing the vehicle into an orbit of 276 by 302 Kilometers and beginning the process of phasing HTV toward the Space Station in its 401 by 409-Kilometer orbit. 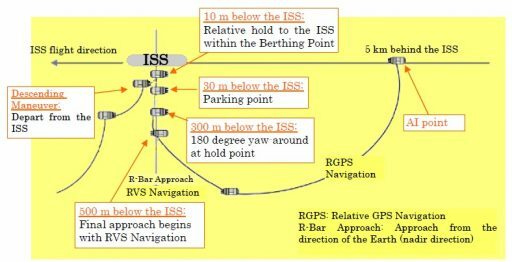 A pair of Height Adjust maneuvers at 18:11 UTC on Sunday and in the early hours on Monday put the spacecraft into an orbit of 368 by 385 Kilometers where it continues to catch up with ISS. 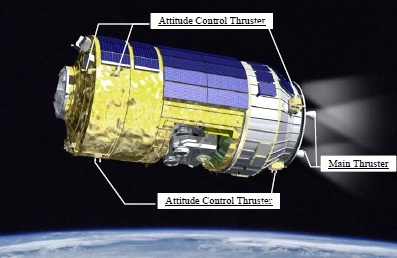 Another burn is expected around 1 UTC on Tuesday to move HTV-6 onto its approach path toward the Space Station. Integrated operations between HTV Mission Control and ISS Mission Control Houston pick up at around 3:30 UTC with Tsukuba in charge of commanding the HTV and Houston responsible for the decision-making during the rendezvous phase which picks up with the HAM2 maneuver seven hours before the scheduled capture time. This engine burn puts the HTV on a path to intercept a position five Kilometers directly behind the Space Station where it will remain until the Approach Initiation Burn which places the spacecraft on a trajectory to a point directly below the Space Station. 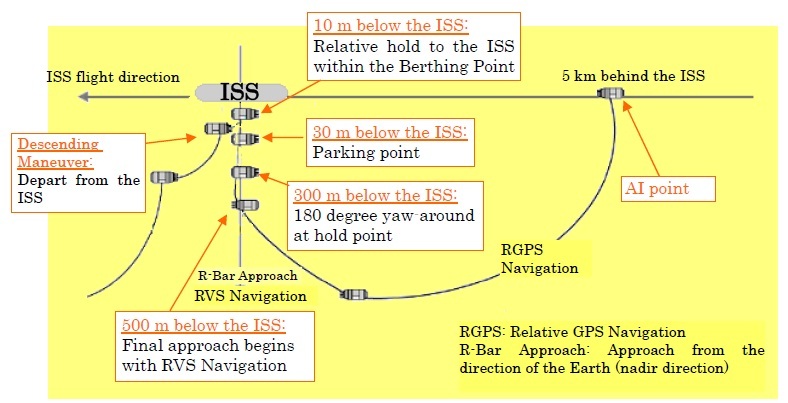 Prior to starting the close approach, HTV-6 transitions to relative GPS navigation for more accurate positioning relative to the Space Station. Aboard ISS, Expedition 50 Commander Shane Kimbrough and ESA Astronaut Thomas Pesquet will begin tracking the approaching vehicle from a distance of around 1,000 meters, also checking whether they can command the spacecraft via the Hardware Command Panel set up in the Station’s Cupola and interfacing with the Kibo Proximity Communications System. HTV-6 intercepts the R-Bar around 350 meters below the Space Station and, at that point, switches to the Proximity Navigation System using a series of retroreflectors on the Kibo module and US Segment to bounce laser light off of in order to calculate its range, range rate and relative position. Also, the spacecraft adjusts its attitude to properly position the thrusters for a possible abort maneuver which would be performed along the positive velocity vector. At a distance of 250 meters, the approach will be paused to provide teams on the ground some time to check the performance of the navigation system, ensuring HTV-6 is processing valid data and is in a good position within its pyramidal approach corridor towards the capture point. The approach will then be resumed and continue to 30 meters where another pause is planned to await the proper starting time for the final approach – based on desired lighting conditions for the robotic capture by the crew. 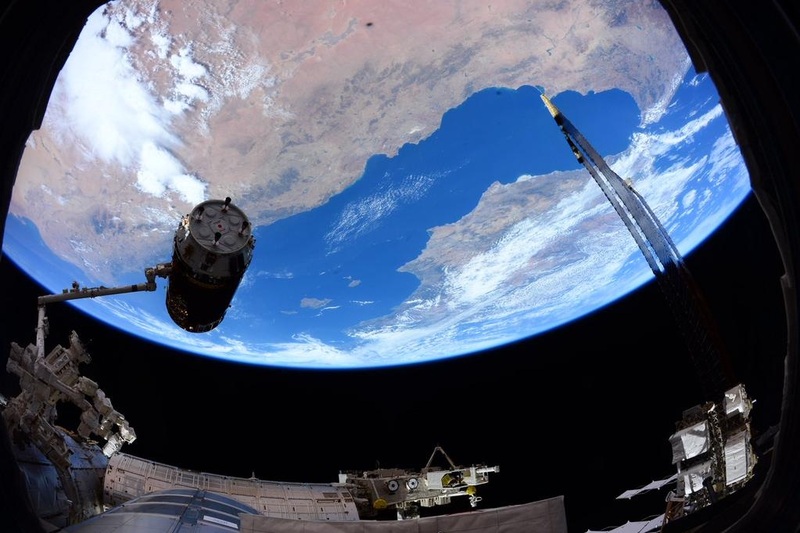 HTV will complete its final approach at a glacial pace, requiring around 20 minutes to cover the last 20 meters to reach a position within reach of Canadarm2 that will be primed to capture the spacecraft. At the capture point, the ten-meter long cargo vehicle will automatically reduce any relative rates to hold perfectly still for the capture – disabling all thrusters shortly before grapple by the arm. Once given a Go for capture, the crew will align the arm’s Latching End Effector with the grapple fixture on the side of the HTV before pulling the trigger and placing the end effector over the grappling pin & commanding snares to close to obtain a firm grip of the spacecraft. Capture is planned for 11 UTC but the exact timing can vary depending on the progress of the rendezvous. When Canadarm2 has a firm grip of the spacecraft, the crew in orbit will hand robotic duties off to the ROBO team at Mission Control in charge of the berthing operation to the Earth-facing port on the Harmony module of the Station. This process takes several hours and entails a series of maneuvers of the arm to first reach a pre-install position for a survey of the craft’s Common Berthing Mechanism before pushing in for a precise berthing guided by video from a Centerline Berthing Camera System. ROBO controllers will be looking for four GREEN Ready to Latch indicators which may take some fine-tuning of the spacecraft’s position before closing four capture latches that will allow the arm to transition into a limp-mode and give the HTV some wiggle room during second stage capture. Four sets of four bolts will be driven to firmly attach the spacecraft to Harmony with specific torque loaded on each of the bolts to tightly pull the redundant pressure seals in the hatchway together. After a period of leak checks on the vestibule between ISS and HTV, the crew will be given a GO to open the Harmony hatch and put in place power and data jumpers to deliver electrical power from the Station to the visiting vehicle. More outfitting steps will be required before opening HTV’s hatch which – depending on the overall timeline of the day – could occur as early as Tuesday evening to give the crew access to 3,900kg of cargo inside the Pressurized Logistics Carrier of the HTV. 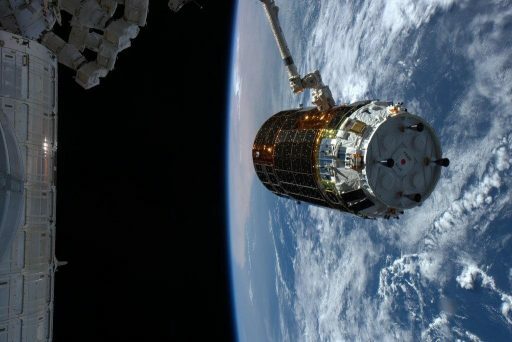 The docked mission of HTV-6 is the busiest to date with a packed schedule inside and outside the Space Station as the crew will be tasked with plenty of cargo moves to unload the vehicle and re-load it with trash while, on the exterior, the Station’s robots will be in action to begin the battery replacement effort. 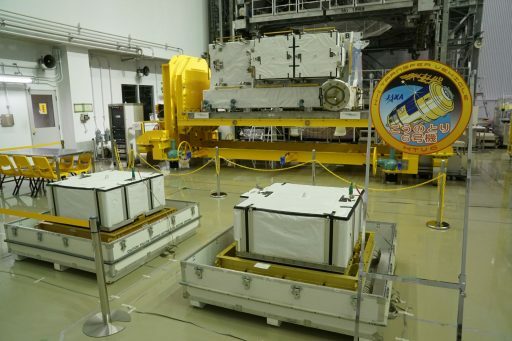 Affixed to the HTV’s Exposed Pallet are six new Lithium-Ion batteries that will replace a dozen of the Station’s aging Nickel-Hydrogen Batteries – marking the start of a multi-year replacement effort with four HTV missions needed to deliver two dozen new battery units. This first batch will be installed on the S4 truss segment which has been in orbit for a full decade. The six batteries delivered by HTV-6 will be installed in an extensive robotic effort and a pair of spacewalks by the station’s crew in early January to end up with six new batteries in place on ISS and nine old ones aboard HTV for disposal while three remain on Station as replacement units. At least two EVAs will be conducted by Pesquet and Kimbrough – planned for January 6 and 13, though there could be additional excursions in case the Dextre Robot and Canadarm2 run into problems that require a human hand to help.